Deputy President of South Africa Cyril Ramaphosa speaks at a press conference in London, Sept. 25, 2017, after helping to present his country's bid for the 2023 Rugby World Cup. In South Africa, the race to watch is the competition to select the next head of the African National Congress. The new leader is selected at the ANC conference in December. Since the ANC has won every national election since white-only rule ended in South Africa in 1994, its next leader will be in a good position to replace current party chief Jacob Zuma as president when his second and final term ends in 2019. There are two top candidates: Deputy President Cyril Ramaphosa, and Zuma's ex-wife Nkosazana Dlamini-Zuma, a former cabinet minister and chairwoman of the African Union Commission. 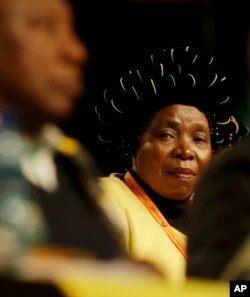 FILE - Former African Union Chairperson, Nkosazana Dlamini-Zuma, looks toward deputy President Cyril Ramaphosa, during their policy conference in Johannesburg, South Africa, July 5, 2017. Each has strong support in the party, but both carry significant political baggage. Although they've been divorced 20 years, Zuma backs his ex-wife. And that could be a hindrance in her campaign. "I know she made an appeal to say that she is her own person and should be president in her own right," said Sara Gon, a policy fellow at the South African Institute for Race Relations. "[But] I still think Nkosazana Dlamini-Zuma's suffered too much from being her ex-husband's candidate." A key problem for Dlamini-Zuma, a former cabinet minister and African Union chairperson, is the series of government corruption scandals during Jacob Zuma's years in office. Gon said Ramaphosa has credibility as an anti-apartheid activist, as the lawyer who led the drafting of South Africa's first post-apartheid constitution, and as a businessman. But there's one big stumbling block. "I think that he does have a Marikana problem," said Steven Friedman, the director of the Center for the Study of Democracy. In 2012, Ramaphosa was executive director of the company that owned the Marikana mine. He asked police to take action against striking workers. Soon afterward, police opened fire, killing 34 strikers. Ramaphosa has apologized repeatedly for the massacre, saying he never meant for anyone to be hurt. Friedman said there are people who would otherwise support him who are uncomfortable about Marikana. "But I'm not clear to what extent that will make a difference," he added, "because fundamentally, this is about a battle between two factions." For the faction endorsing Ramaphosa, Friedman said opposition to the Zumas outweighs anything their candidate may be guilty of regarding Marikana and in his private life. Ramaphosa's business dealings have made him one of the richest people in South Africa. His opponents attribute his net worth of $450 million largely to him being a major beneficiary of the ANC's policy of Black Economic Empowerment. The deputy vice president has championed the poor, but has been criticized for a luxurious lifestyle that includes expensive cars and vintage wine. Gon said people are so unhappy with Jacob Zuma that they're ignoring Ramaphosa's flaws, including allegations he's had many affairs with younger women. "Even [among] conservative South Africans, I don't think it will be held that much against Ramaphosa," she said. Ramaphosa said he wants to create an ANC free of corruption. Yet his his critics say he's been a "loyal servant" to Zuma for five years without saying anything against graft. But Friedman said Ramaphosa's usual style is one of quiet opposition to things he disagrees with. "Really what we're seeing within the ANC is trench warfare between the faction which supports the president and the faction which opposes the president," he said. "So when one says he [Ramaphosa] is a loyal servant, I think that the more accurate description would be [for Ramaphosa] to say, 'Well, there's a factional battle in which you win some and you lose some.'" In the campaigning, Ramaphosa has focused on an anti-corruption platform, while Dlamini-Zuma said she'll give more black citizens access to South Africa's wealth, which she says is still mostly controlled by white capitalists. Gon is convinced that whoever wins ANC leadership in December will inherit an organization that's greatly diminished, mainly because of President Zuma. "There's very likely to be a split [in the ANC] if either side won," she said.